Thank you for your interest in ReviewForge. We will be in touch shortly to answer any questions you may have and move closer towards a better reputation for your business online. After we receive your information, we will reach out, answer any questions you may have, help setup the perfect plan for your business, and go from there. We have received your input. We will reach out shortly and answer any questions you provided. Thank you for your interest in ReviewForge. Do not hesitate to ask. We are always looking for ways to tailor solutions to our client's needs. You are well on your way towards a better online reputation. 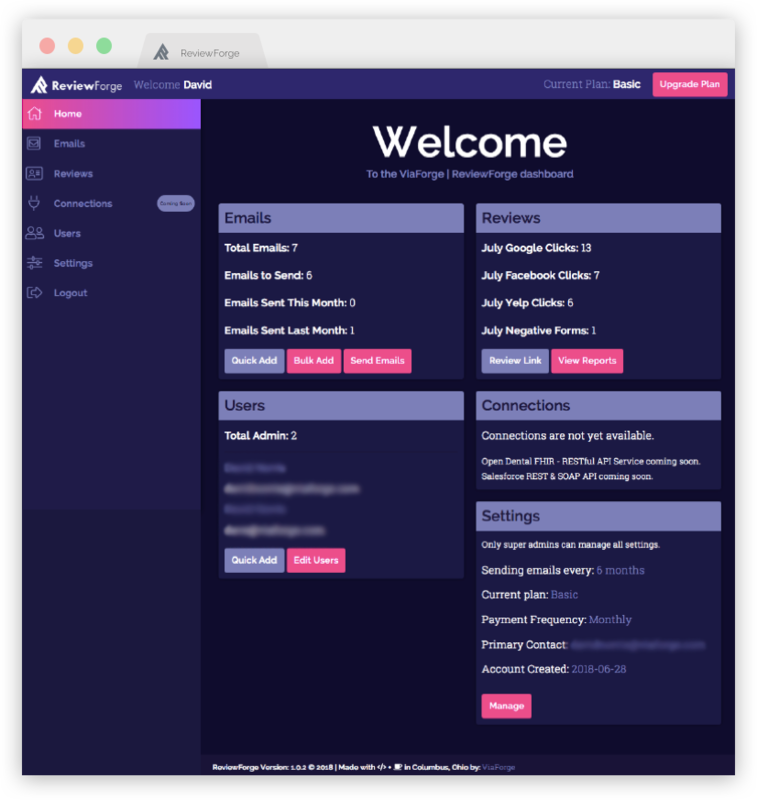 We will reach out shortly and schedule a time that best suites you to demo ReviewForge. After we receive your information, an account manager will reach out and setup a time to demo ReviewForge. If you have any questions in the meantime, please feel free to contact us. Sometimes you may need a little extra. Packages are add-ons that can be placed on any account at any time. Choose from pre-built packages or build your own. If you would like to make a specific request for a platform not listed, contact your account manager. You can pick and choose which sites you would like to include in your review links list. Each site outside of a package is $6.99/mo. All ReviewForge accounts come with Google, Facebook, & Yelp. We will reach out shortly to discuss with you your specific plan and details. After that, your account manager will get your ReviewForge up and running. The plan looks good on you. You can always upgrade and downgrade as needed. In fact, everything is customizable. We will reach out to you to confirm your ReviewForge choices and start setting up your links and dashboard. Would you like additional packages? Sites, are discounted almost 15% in packages! If not, that's okay, you can always add these later. If you want additional sites added to your ReviewForge account, they can be added upon request. Each additional site is $6.99/mo. We will work with you to get the right ones for your type of business and reputation goals. Payment will not be due until your account is setup by ReviewForge. Total does not reflect additional sites. A sleek and powerful reputation gateway and review management platform. Perfect for earnest brands looking to build positive public reviews. Keep current customers happy, build trust and visibility, and attract new customers. Affordable yet wholesome reputation management. A user sees this page first after receiving the link from you which allows them to easily select the type of experience they had. This “gate” keeps most negative reviews from landing on public platforms. If the user had a negative experience, they are then taken to a form that submits directly to the brand manager. This submission will never see a public platform and allows for a much closer form of interaction to correct problems, make the situation right, or put minds at ease. 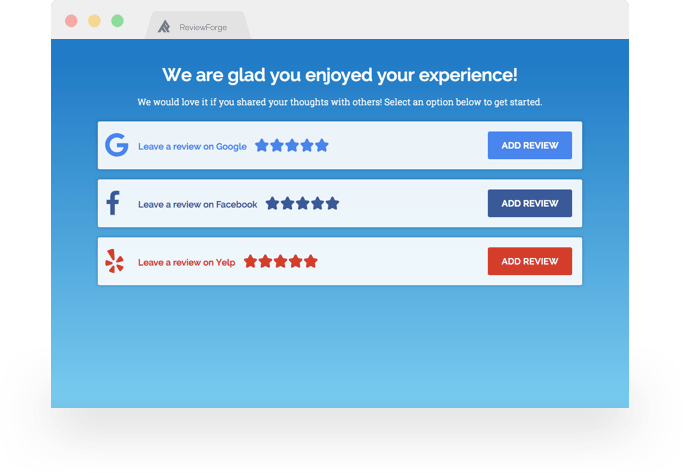 If the user had a positive experience, the gate is opened and your public platforms are opened up for them to leave reviews on as many as they would like. 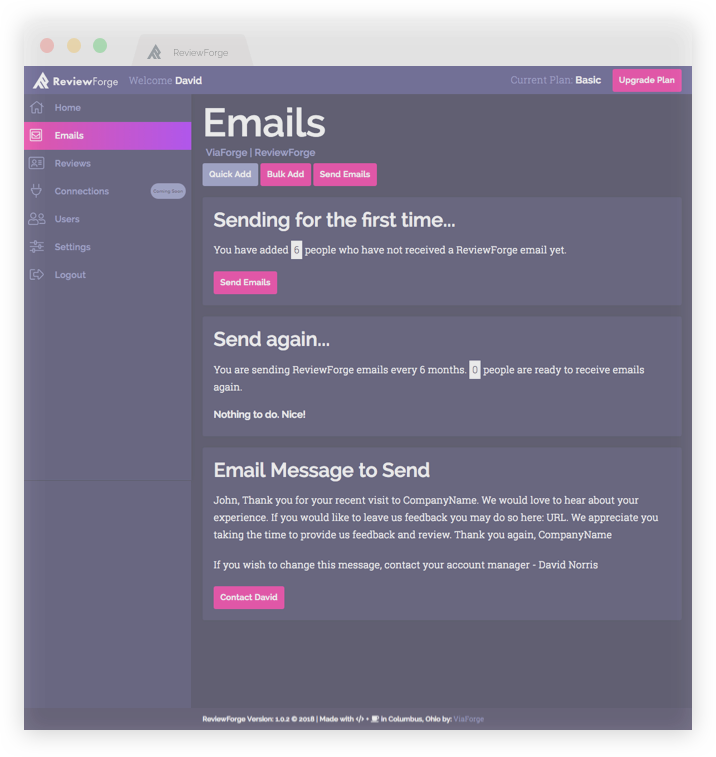 The ReviewForge dashboard let’s brands take control of who they are sending feedback requests to, how often they send the requests, and reports all actions taken by the users on ReviewForge. ReviewForge reputation management plans start at $149 per month and can be combined with numerous add-on packages. Need a specific feature? Our team can make it happen for you — contact us. Add the Health Package for only $47.92 per month. 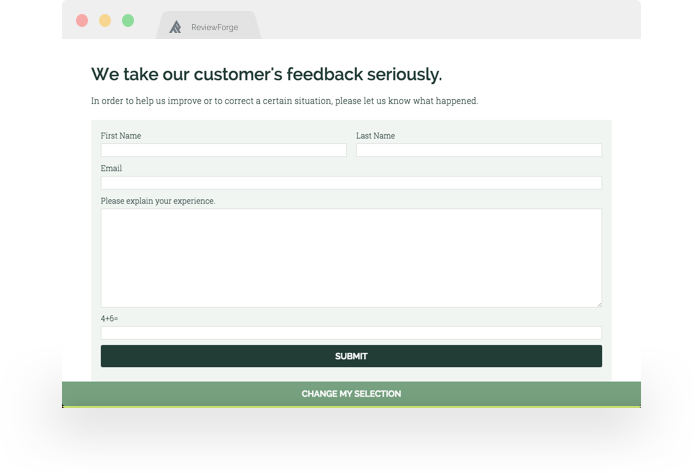 Every ReviewForge account comes with an account manager to help with strategy or tasks — large or small. From complete management to single tasks, your account manager is always available to help. Our job is to ensure that your brand looks it’s best as well as provide a solution for it to remain that way. 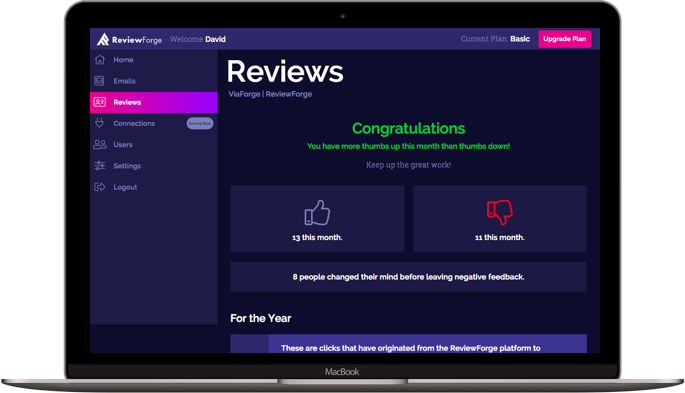 If you are looking for more reviews, better public feedback, or need help engaging with negative feedback, ReviewForge is the perfect lightweight and connected solution. 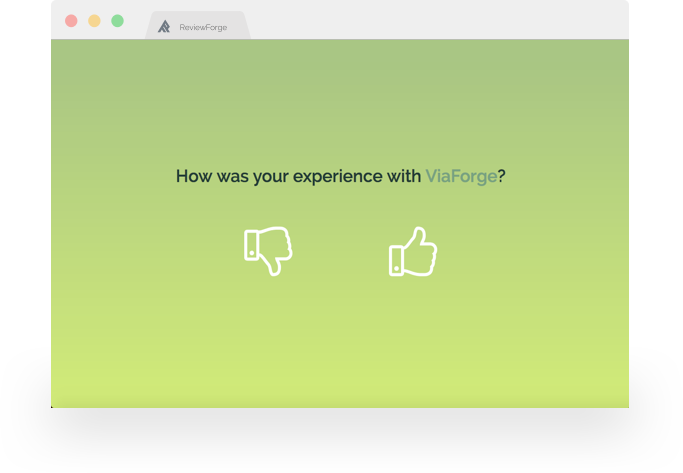 ReviewForge is owned and operated by ViaForge - a Columbus, Ohio digital marketing agency.